Sangoma Released New Zulu UC 3! 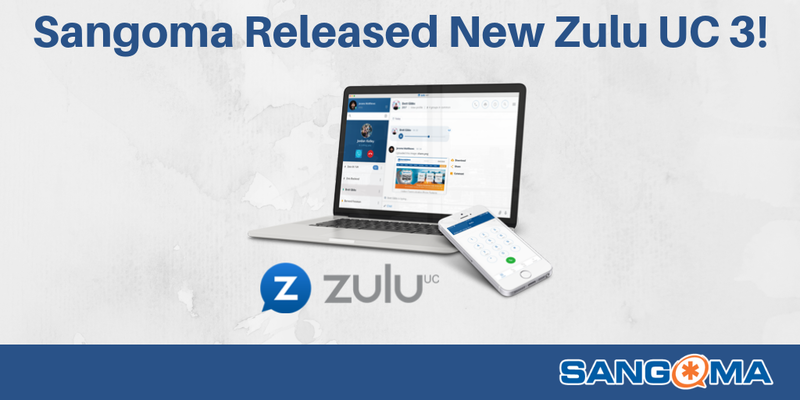 Sangoma is excited to announce that Zulu UC 3 desktop integration is now available! Designed to work with FreePBX and PBXact business communication systems, Zulu UC unifies the most popular business communication tools & applications enhancing user productivity and mobility. If you are currently using Zulu UC 2, you can download Zulu UC 3 and upgrade your PBX module. With Zulu UC, you are able to make and receive phone calls directly from your laptop or desktop computer and stay connected with your colleagues through with 1:1 instant messaging or create rooms for project collaboration. Sangoma also introduced its Zulu UC Mobile Application that allows you to take your phone extension with you on your iOS or Android device! Zulu UC Mobile is now in BETA, Join Here!